NEW YEAR ALIVE! Based on traffic in recent years, AAA predicts that it will provide about 500 Arizona drivers with a Tipsy Tow over the upcoming New Year’s Eve. The horrors of Drunk driving is really hitting home as 91 percent of U.S. drivers believe it is unacceptable for someone to drive when they think they may have had too much drink. However, one frightening statistic leaps off the page as one in eight drivers who consume alcohol admit to driving drunk. Call 1-800-AAA-HELP (1-800-222-4357) between 6 p.m. Dec. 31 and 6 a.m. Jan. 1. Provide the driver’s name, home address, phone number and vehicle/driver location. Tipsy Tow provides a free 10-mile tow and ride home. For mileage beyond this, motorists are charged a standard towing rate. The service does not include roadside assistance and it will not take you from party to the next. Last year, more than 29-thousand DUI arrests were made in Arizona in 2013, according to the Arizona Governor’s Office of Highway Safety. AAA estimates that a first-time DUI conviction can cost a motorist more than $10,000 in fines, penalties, legal fees and increased insurance costs. Since its start in 2009, AAA Arizona’s Tipsy Tow has kept thousands of impaired drivers off Arizona roadways. 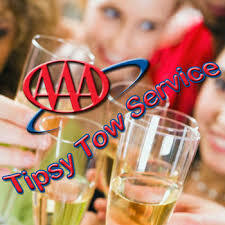 For more information on AAA’s Tipsy Tow, visit AAA.com/TipsyTow. Download a high-resolution Tipsy Tow logo here. Next2014 goes out with SNOW!